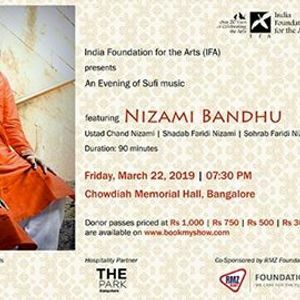 India Foundation for the Arts (IFA) is delighted to present An Evening of Sufi music in Bangalore with the Nizami Bandhu featuring Ustad Chand Nizami, Shadab Faridi Nizami and Sohrab Faridi Nizami on Friday, March 22, 2019 at 7:30 PM at Chowdiah Memorial Hall. Nizami Bandhu has a 700-year-old rich legacy of Qawwali, contributing to the growth of this soulful genre of Sufism—taking it to greater heights and securing firm ground in the forum of world music. The Sufi band hails from the legendary and lustrous "Sikandra Gharana" which has produced some of the finest gems of Qawwali singers over the ages, best known for their versatility and serenity that have reflected in their songs. The responsibility of carrying the legacy forward is presently being shouldered by Ustad Chand Nizami, Shadab Faridi Nizami and Sohrab Faridi Nizami—who are also known as the Nizami Brothers. The band has been awarded the prestigious Indian Icon Award and the Rajiv Gandhi Global Excellence Award. The essence of sufiyana kalaam is oneness, while qawwali is about ruhaniyat (appeal to the soul). We believe God resides in our hearts, neither in structures nor in rituals. to continue its grantmaking in the arts. who have made this event possible through their generous contribution. Our current Friends of IFA do get in touch for an exciting offer! Please call Menaka at 080 2341 4682/83 or email bWVuYWthIHwgaW5kaWFpZmEgISBvcmc= for details. We hope to see you at the event, so book your donor passes soon!